I know I already posted today but I had a little time when I was working on my craft room to bust out a cute little card. I bought a pack of Martha Stewart mini note cards at Joann a while back. So today I decided I needed to use them. They are a softer peachy pink but I inked the edges with the new Tim Holtz summer ink pad Picked Raspberry. I hit the edges a little darker and did bring the ink in a bit to create the pink halo effect. The stamped sentiment is from the Close to My Heart set So Lucky.I stamped it in dark brown ink and added the pink gems. For the envelope I inked just the edges a couple times to get the dark pink to show. I added the Strawberry Cupcake Trendy Twine bow. To finish it off a glitter heart with a pink gem. So easy, so quick, and so cute! Hope you like it. Well....the cat is out of the bag. I'm now officially part of the Trendy Twine Design Team! I am so excited to get crafty, and create some great projects with this fantastic product! For those of you that are new to my blog I'd like to tell you a little about myself. I have been married to my retired Air Force hubby for 16 years. We have two beautiful girls, ages 3 and 4. I have been a crafter for as long as I can remember, but I have become more serious about it in the last year. I created my blog, I have a project published in Cricut Birthday Idea Book this month, and now I am on my first design team. All of this in less than a year! I would classify my crafting style as a little shabby chic, a little cutesy, and very fun! I love to do more elegant projects when the mood strikes but no matter what, I always try and keep my creations quick, simple, and stunning. Enough blabber about me. On to the projects I created that landed me a spot on the team. Oh...and I made the cupcakes too! Everyone knows I love cupcakes right? So I couldn't resist creating this cupcake stand using the Cupcake Stand die from Lifestyle Crafts. The paper I used was a Martha Stewart stack I bought at Joann. All the edges were inked using Tim Holtz Festive Berries distress ink pad. The twine I chose to accent my project is Trendy Twine Valentine Cherry Cupcake. I used it to cover seams on the stand, weaved it through a paper doily placed under the cupcake, and added twine bows to the doily and the strawberry topper. A few pieces of bling and it's perfection! If I do say so myself . To make the card I used the same Martha Stewart paper and took advantage of the negative space left from cutting the base circle for the cupcake stand. I cut the card at 4 1/2 x 6 and lined the circle up over the strawberry image. I popped the card up on foam dots to create a little more dimension. The circle was framed with the Valentine Cherry Cupcake twine, and a twine bow added to the top. Rounded corners, a little bling, and a Happy Birthday stamp from My Creative Time finishes it off! Well crafty friends, I hope you like what you see. I have so many creative ideas swirling around in my head that I can't wait to share with you. I'm hoping to start filming some videos for you soon. My first post will be up on the Trendy Twine blog on July 2nd, and another on July 18th. Here is a list of the entire Trendy Twine design team and their blog links. Please hop along and visit each one leaving a comment on all of them and the Trendy Twine blog to be entered in the giveaway. You could win a spool of your choice! Thanks for stopping by! Come back soon for more inspiration! First of all, IT'S FRIDAY! 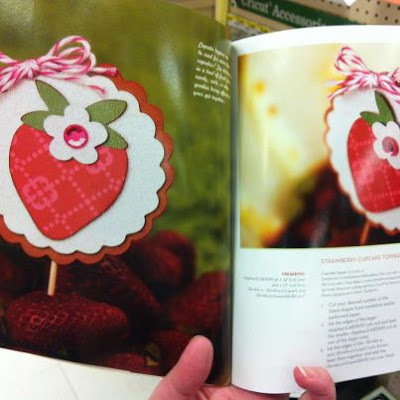 Second, I am excited to to share with you that my first project has been published in Cricut Birthday Idea Book! Another goal checked off my list. Third, today I have coffee in hand finishing up my final 3 days of work before I am a full time crafty mom! I'm so happy for the creativity to be unleashed. And finally, my big news will be hitting my blog on Monday. So it's very busy around here! I hope you will come back Monday and see what is making me a happy girl. Hopefully you will be happy too!